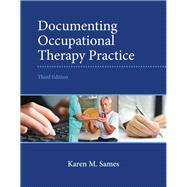 A comprehensive guide to creating effective documentation in occupational therapy. Documenting Occupational Therapy Practice, 3/e is the most comprehensive text on occupational therapy documentation currently on the market, covering general documentation principles, clinical documentation, electronic documentation, school system documentation, and documentation of administrative tasks. More than just a how-to manual, the text explores important ethical, legal, and language issues related to documentation in addition to presenting step-by-step strategies for creating successful SOAP notes, communications, and documentation. The Third Edition has been fully updated to reflect current AOTA official documents and new electronic documentation tools, and has been reorganized to improve readability. Effective review tools help readers truly master documentation techniques and strategies, while the text’s accompanying website provides additional learning resources that can be accessed on the go. Comprehensive coverage of all areas of practice: Chapters examine the underlying concepts of good documentation in clinical, school, and administrative settings. Practical techniques and strategies that prepare students for the workplace: Chapters present clear, effective strategies for drafting documentation and communication that can be directly applied in professional settings. Exploration of ethical and legal issues: Discussions help students understand how documentation affects others and provide problem-solving strategies for addressing legal and ethical issues. Coverage of electronic documentation: Screenshots and discussion of electronic health record (EHR) systems familiarize students with current documentation technologies. Effective learning tools: Review exercises and numerous reference tools help students truly master text material.